Red Crown is a sci-fi novel set in U7, and it’s a prequel to Minotaur game. The novel is written by Nick Green and illustrated by Adam Kuczek. Jump in and read first chapter below; we’ll upload the next one when it’s ready. Would you like some music with that? Aria’s briefing on what he could and couldn’t do (much more of the latter) with his sept badge tired Troy out. He closed it and looked at the two kids glued to the large window in front of him. The boys, who were around the same age – nine, maybe ten years old – were arguing about whether or not they would see Tautos. Vince never went Outside in these parts – his unit mostly did missions to the south of Ares – but he remembered that Tautos was one of the larger Demons, who wasn’t very mobile and preferred to stay in the Eastern Plains area. Vince looked around the car, trying to spot their parents or caretaker. There, a male android to his left was carefully observing the boys. Not too close to bother them, but not too far if he’s needed. Someone tuned him nicely. The train slowly came to a stop, and its doors opened to let passengers and chilly air in. Arks near domes usually had heavy traffic, but this time just a couple of travelers got on. One of them, a middle-aged woman with high implant rate – after years of service Vince could tell – walked through the car and stopped near him, then asked if she can sit down on his bench. The car was only half-full and there were other empty seats, but Troy said he doesn’t mind. He really didn’t: she seemed like a quiet type, and they were close to the dome. He turned back to the kids and noticed how they froze in place. The car fell silent; like many others, Vince disabled his window filters and shuddered. Tautos was very close to the train – as close as possible, Troy thought. 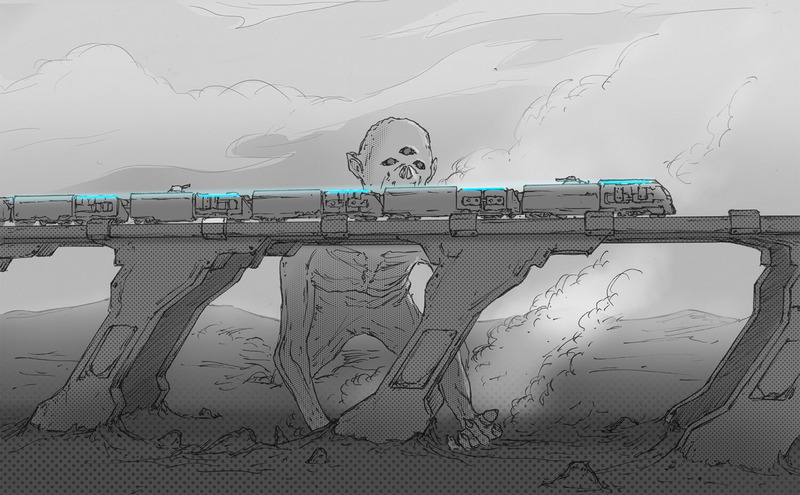 The train was still picking up speed from last ark, and Demon was slowly turning its hideous head in its wake. They were thirty, maybe even forty leagues above ground, and still it was just at the level of His eyes – three swirling lakes of dark silver and molten quartz. Hands of Tautos, which were probably twice the length of His body, were lifelessly lying on the ground. Despite His gigantic size, Demon was painfully thin – bones have teared through grey rubber of His chest, making it look like a barren land enclosed with scattered fence. Tautos was standing on his knees, and probably didn’t move for a long time – His legs went several leagues into the ground, which couldn’t support the weight of His colossal body. It took them several seconds to pass creature by. Both kids let go of the banknote, which they tried to tear apart a moment ago, and it slowly fell between them on the bench. They sat down next to each other without saying a word. Vince noticed how their caretaker made a slight movement in their direction, but then stopped. Vince sighed at his lapse in judgement and turned to woman already sitting next to him. She was looking away from the window and smiling. Troy nodded his head in direction of Tautos. “That’s why you got in?” he asked. Troy shook his head and pointed at small device fixed on her belt. The expression on her face quickly turned sour. Woman hid her face between her hands. She was trembling. Either the shock was starting to wear off, or she was trying to cover the whole thing up from the start, Vince thought. He tapped her on the shoulder. She nodded. Announcer with a voice of an empyrean creature – Vincent often thought that if she told him to jump off from the train, he probably would – informed passengers they are one minute away from their destination. She finally removed her hands from her face and looked at him with eyes red from crying. The train came to a stop. Mirian station was universally considered to be one of Kyosian post-War architectural marvels. Before entering the dome, trains went through large structure, which was jointly maintained by Mirian Ops and TFX corporation. Technically, it was part of the station, but most trains passed it by, and even when they didn’t only passengers with clearance could get on and off. In truth, it served as big Outside research lab – with shared reality, but without protection from Axis field. 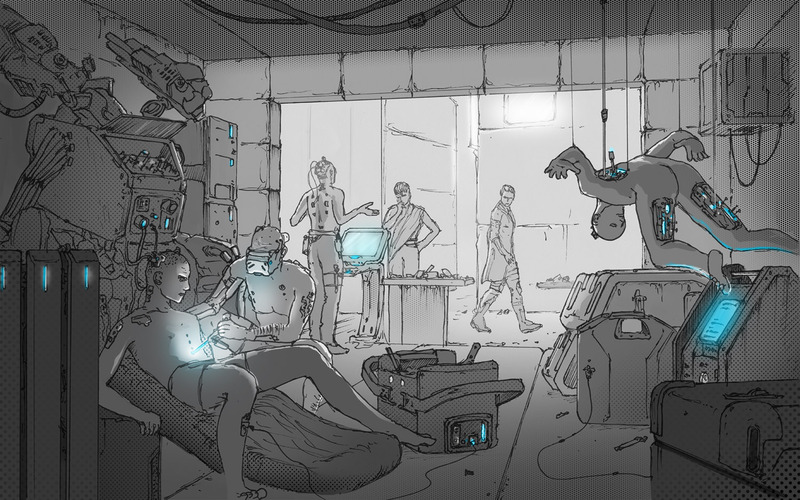 Since Demons rarely came so close to the city, and Precursor, as the lab was unofficially called, was well-defended against other threats, Mirians were inclined to think that benefits of testing new technology in the field without interference outweigh potential risks. That, and they had reputation to uphold. Most Kyosians would say Mira was the most technologically advanced dome city on the continent. Five hundred years ago Axis fields like the one they passed just now effectively destroyed objective reality on Kyos, and no sept dared to improve upon generators built by Norma Tali. None but Miras, who managed to increase Axis output by 20%, thus gaining more land for their city. This happened gradually, over the course of centuries, and now that they were passing this retaken territory (which Mirians, who could challenge Pionians in their love for numbers, called Zone 0 ring), Vincent noticed how buildings here look like giant patchwork, with each floor representing another layer of Mirian history. Main Mira-Nova terminal was located in Zone 2, closest to Axis pillar which supported the dome. After hunters finished their scan and Station Master confirmed there’s no esper threat (of which Vince thought: “Was there ever?”), synthets, androids and a couple of penguins poured from the train onto the platform, disappearing in one of many corridors of the station moments later. Just like in other domes, train to Nova was leaving minutes after the one from there arrived, leaving little time for someone who, for whatever reason, needed to go back, so Vince decided to make sure his new acquaintance, unstable as she was, catches her ride. She did, and after she left Vince found himself standing on the platform almost alone. Almost, but not completely. He noticed two young man who, he could swear, sensed his vulnerability and started circling him like tainted vultures. They seemed almost pure, which was a surprise, at least in Mira, so Troy was somewhat intrigued, even though he was convinced nothing good comes from strangers with old-fashioned binders in their hands. He also had nowhere to run; they probably figured it out as they were getting more and more confident as they approached. Vince sighed. Who doesn’t dream to hear those words? Vince didn’t like their questions, but had even less appreciation for manner in which they were presented. He knew where this was going. Then suddenly he had an idea. Having quickly convinced himself Aria’s instructions were kind of vague, he enabled sept ID that he was assigned in Nova. Eyes of young men turned wide. Troy could see how their sense of danger alarmed them, but they still hesitated about whether or not they should leave. That did it; now he was talking to their backs. They moved fast (apparently trying to look like they suddenly got very busy), and Vince decided that he should follow their example before he attracts someone else’s attention. After all, he didn’t really need a guide to get around. She was just supposed to let him know how local transport system works, maybe give a couple of useful tips. It would take more time, but he could certainly find Germa on his own. 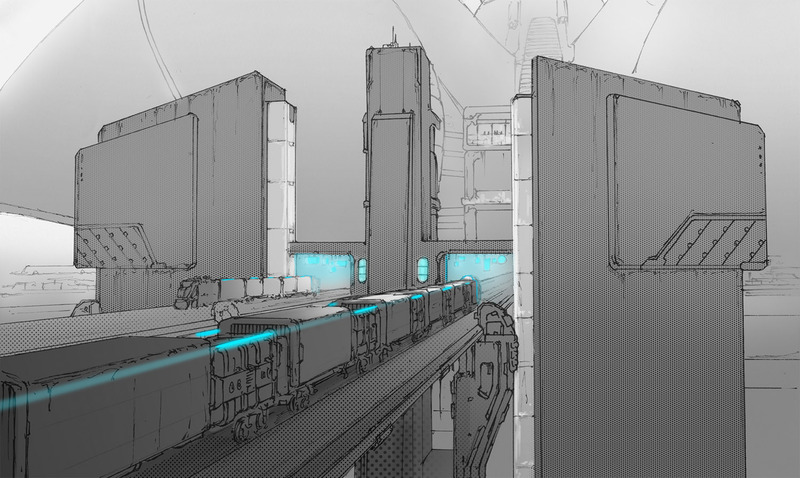 Each corridor leading away from the platform was carefully labeled, but there were so many that Troy decided to just get out of the station and find his bearings then. For that, he figured, any of them would do. He headed for the one closest to him, but just as he was turning around the corner, he bumped into a ball of energy emerging from the corridor with incredible speed. And so on. Pauses between questions were very short; he was maybe supposed to answer them all at once. After trying his patience for couple more minutes, Vale gave up and explained him best way to get to Germa, and then to Pyrax hotel (“Did you know there’s a peninsula called ‘Pyrax’ to the north? I heard they have a Collective there.”), where Troy was staying for his trip. She gave him several comm points and practically forced him to promise he will call if he needs anything, anything at all. After that, she walked him to the right exit (the one he picked by himself was, of course, furthest from the one he needed) and put him on a clockwise Linkway to Zone 1B. Domes handled their Axis differently, but each made a show out of it. Some, like Novians, achieved unique circular pattern on their field; Artasians, turned it into a giant display; Somas experimented with its color and density. In Troy’s opinion, Mirians bested them all. Unlike other domes which projected their field from ground up, Mira was supported by a colossal pillar of streaming energy, which exploded into beautiful flower high above the city. Vince could see it flickering between buildings; that wasn’t Axis, of course – what he saw was just light – but someone did a good job on it. Color palette, in particular, was very impressive: all kinds of blue and purple gave central part of the city its very characteristic color, which citizens themselves called “Mirian blue”. Germa lived on the other side of the city, but Vale, who programmed his route, assured Troy that by Linkway, he’ll be there in less than an hour. Surface of Linkway was powered by Axis, and buses like the one he was on picked up a nice speed without any interference. This was smart, Vince thought. Ares, his home city, was carved into a rock, and Aresians didn’t have the luxury of building their own transport system. Nova, where he was staying until recently, had a complex layout, where everything seemed to move in chaos (when ground or air traffic did actually move). Mirian Linkways ran like clockwork. The road constantly changed elevation, sometimes reaching as high as fifty leagues above ground; every time that happened and they were passing another office skyscraper, Troy could see synthets in blue shirts and androids in white dresses within arm’s reach; as far as he could tell by their IDs, half of buildings in the city belonged to TFX corporation, a company which was founded by people of questionable background during March of the Damned nearly two hundred years ago. When he asked Jacob about how sawbones could get official support of their sept, the latter shrugged his shoulders and said: “They were talented people. Their talent was needed.” No wonder Mirians were so efficient. Troy was distracted from his thoughts by a notification telling him to get off. Just like Vale promised, he was almost at Germa’s place in forty minutes. All that was left was to climb long, narrow street to his apartment complex. Germa lived right on the border of Zones 1 and 2 (Vale made sure to point out that technically, it was still Zone 1). Vince got used to the fact that in Nova, you could see all kinds of Kyosian folk anywhere you went, be it Rim districts or city center. In Mira, social hierarchy was more apparent; the closer Troy got to Zone 2, the less diverse his encounters became. The street he was climbing now was called Leather Feather street – Vince was surprised it was not just numbers and some letter (which would probably be better than this embarrassing name), and thought that it’s likely one of those streets Jacob named during days of his pro-penguin policy after one of their clans. Pinz loved Jacob, that was a fact. 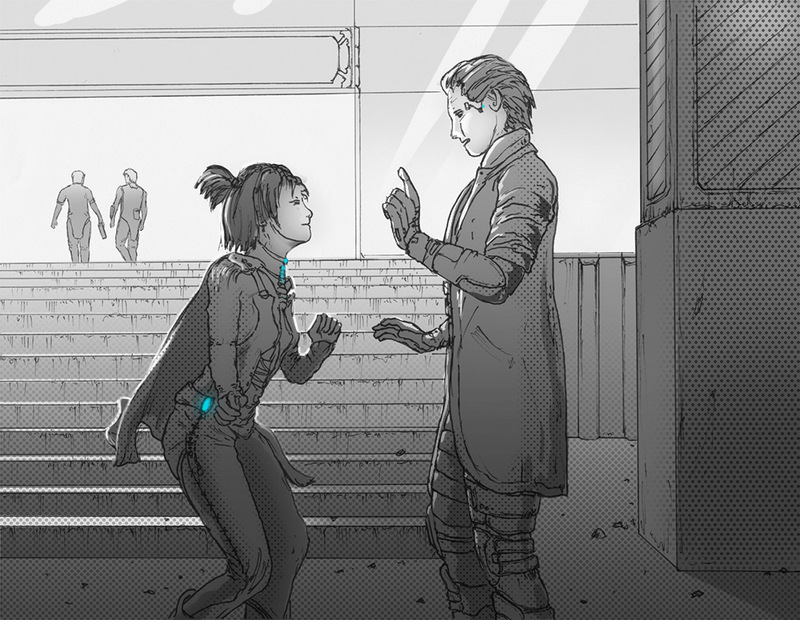 Mira was their waypoint to Kyos, and Jacob did everything to make them feel comfortable here, acting (however hard it was for Vince to admit) not from some ulterior motive, but based on his principles. Despite being so close to Zone 2, Leather Feather was still a lively place. In almost every building, there was a shop on the first floor, and in every second shop, there were synthetics for sale. Many were tended by androids; they sat outside, sending invites to everyone who passed them by and who was stupid enough to have an open channel. Some were busy with clients: abusers like Bart with IR above 65%, daisies with high implant rate but without implants visible to naked eye, and their age-long opponents, nutcrackers, who were browsing through wares looking for something old an ugly to display on their person. After someone parted with their lot and made a purchase, they headed deeper into the store to permanently try it on: famous Mirian sawbones, who only worked on androids at first, now extended the variety of their services, pushing other companies off the local market. Showers of sparks poured forth from windows in small alleys branching off the street; Vince saw how in one of those, they briefly lit a decommissioned Boulder. Giant mech, which got here by some kind of manipulation, no less, stood abandoned near a brick wall littered with holograms. Its cooling unit was ripped off, and two kids were picking it apart, closely watched by two penguins smoking on the porch of what was, judging from pink neon sign, a “Pin Bar”. Germa’s complex was almost at the end of the street, near high wall on which Zone 2 stood. The entrance was open; Vince walked in and found himself in a spacious, well-decorated lobby. Android concierge politely gestured to him. 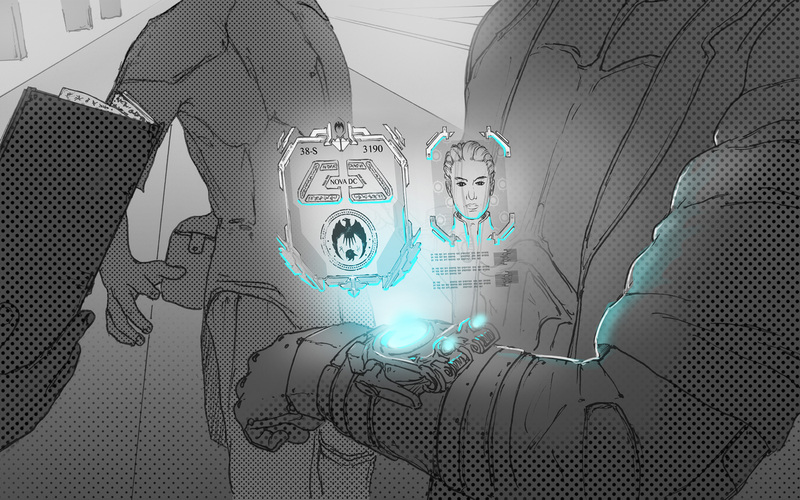 Concierge checked his ID and got a confirmation from Germa’s terminal. Timestamp on both notifications were less than one second apart – a very impressive result. And that was just a concierge in some Zone 1 apartment complex! Vince casually waved his hand as he headed towards the elevators. “So much for her famed accuracy,” thought Vince of Aria; he had little doubt about who was right. Germa’s apartment was at the end of long corridor on the left. Troy figured there were about thirty apartments on the floor – building seemed to be much smaller from the outside. Door opened when he approached. He walked into the apartment and heard a loud shout: “Come in, come in.” Vince took off his shoes and entered next room. Vince took a moment to look around. The apartment was nice: it looked clean and lived-in. Germa decorated it in a mixture of contemporary and Tetrian styles. Troy was surprised to see flowers and birds on wall panels of an Aresian. “Well, your loss. I prepared this just for you.” He opened a fancy bottle standing on the table. “It’s alright. What Aria asks, Aria gets. At least from me!” Germa laughed and Troy noticed how he becomes more relaxed as their conversation goes on. “Anyway, you can get all hard info from there.” He pointed at the report. “Last seen, profiles, Meshnet traces, stuff like that. Obviously, that’s not enough, or MO would’ve found them already. Syl knows they’re trying, with their asses on the frying pan they move and think really fast!” Germa laughed again. Vince thanked him and took the card. Vince nodded. 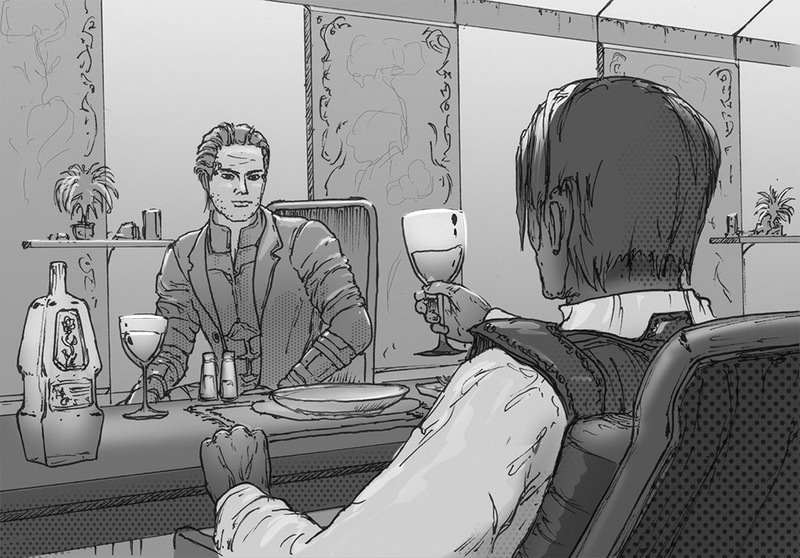 He was surprised at Germa’s wit; Aria spoke highly of him, but Troy got an impression the man who refilled his glass twice already was merely an informant. “I’m also not trying to push you into any particular direction,” continued Germa. “Just keep an open mind… And call me if you need anything. Aria didn’t ask me to babysit you, but she can make anyone feel motivated.” He smiled and stood up, letting Troy know that their short conversation was over. Vince was already in the doorway when he asked Germa about android downstairs. Stone proudly punched himself into broad chest. Pyrax hotel wasn’t far from Germa’s complex, further into Zone 2 (Vince was hoping for a nicer place; at least his sept ID helped him get through zone gate without problems). Another android concierge (could this one be Germa’s, too?) checked him in, and after having inspected his room, which looked like a large closet with a bed someone put there by mistake, he headed to the roof. He was going to pick the lock, but the door was open; chairs were standing here and there around Talian solar batteries (probably one of few pieces of technology Mirians didn’t manufacture themselves), the floor was littered with leftover food, bottles and plastic bags, so either roof was accessible to guests, or whoever run the hotel didn’t care. The view was nice; Troy couldn’t see Axis pillar – it was hidden behind one of four large triangular structures surrounding center of Mira – but Pyrax had fifteen floors and was taller than most building near it, so he could see most of this half of the city. It was true night, short three hours of Hades and Logan both absent from the sky, and Mira was tangled in web of myriad artificial lights. Vince found a sling chair which looked more comfortable (and less dirty) than the rest, put it closer to the edge of the roof, sat back and tried to relax. He turned off screening on the dome to see the stars, but night was cloudy and all he got were a couple of Usurpers hanging above their entry points. He decided to call Bart. It took Vince a moment to understand what he was talking about. He wasn’t aggressive, and Troy knew Keats good enough to understand where this was going, so he just kept silent. “I’m already helping her. Take a look.” Bart turned video on, and Troy saw familiar bowels of a Stormrider. Vince bit his tongue, but Bart didn’t seem to notice. “Jacob is the last person I want to talk to about that,” refused Vince.